When walking around the Toronto International Boat Show I often look for themes among the new boats that are at the show. It’s interesting to see the patterns and where the industry is going and for 2016 in the runabout category one thing is clear: surf boats are all the rage. 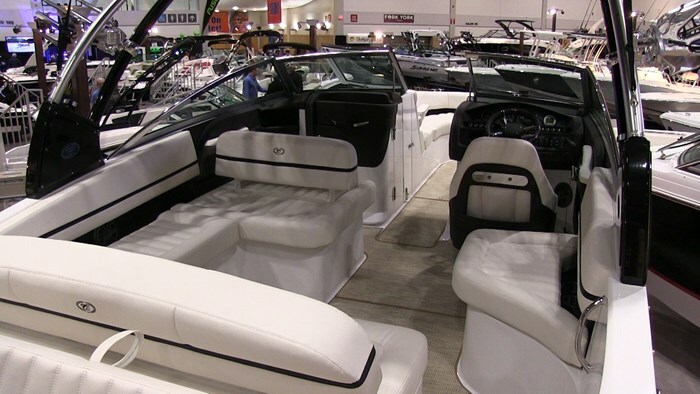 Luxury boat builder Cobalt Boats out of Kansas has thrown their hat or, er, board onto the Wake with their R5 WSS Surf. WSS stands for Water Sports Series so this was a natural fit to be able to add a surf boat to the line-up of 8 water sports dedicated models. What makes this one different? Well it’s actually down below the waterline - the outdrive to be specific. 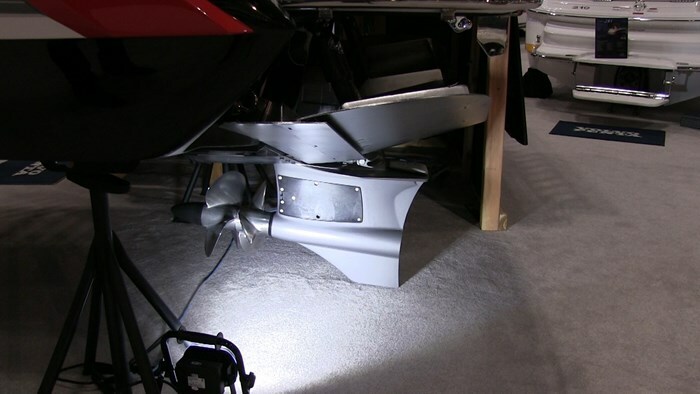 Volvo-Penta drew from their forward facing drive experience that they have with their larger IPS Pod Drive systems and scaled them down to their inboard/outboard outdrives to create the first ever forward facing outdrive. Surfing was always safe behind inboards because the propeller is located safely under the boat. With a traditional stern drive the propeller is dangerously exposed. But by putting the propeller on the front side of the drive is it now tucked safely under the hull - giving you a surfable boat. 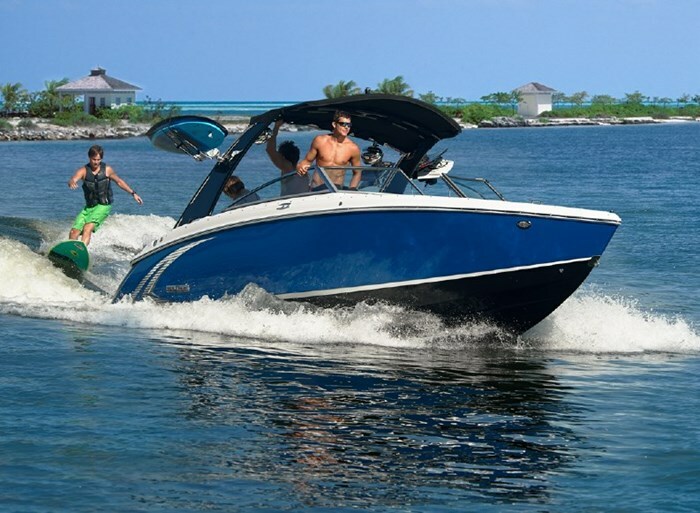 Sterndrives are perfect for surfing because you can trim the angle of the outdrive to affect the attitude of the boat where the propulsion on an inboard is fixed. Additionally, trimming the outdrive up channels more energy into the wave which gives you significantly more push and an overall incredible wave. For further fine tuning Cobalt is introducing their patent pending Wave Control System that automatically tunes the boat’s attitude for optimal surfing. Being able to see the R5 Surf at TIBS I was able to check out the Volvo Drive further but additionally see the massive surf tabs on this boat. This is going to allow them to pump up a huge wave and really clean it up. It’s equipped with Zero Off Speed control to take the variables out of perfection. What Cobalt has done with this line of boats is taken some of their award winning designs from their larger boats and modified them to make this a runabout powerhouse. 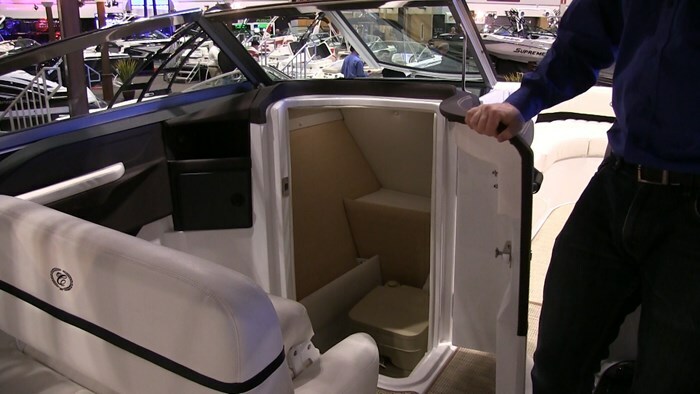 There is a transom walk through on the starboard side of the boat and when you walk in and turn aft there is a large bench seat, the backrest on this shifts forward to give you a massive rear facing sun lounge. This will be better for relaxing when you’re sitting still rather than wake surfing. It’s always encouraged that you sit inside the cockpit when surfing and double check with your region’s safety laws with this. Hidden in the sunbed is another backrest that pulls up to make a bench seat attached to the swim platform. This is going to be great for putting on wakeboards or waterskis. This boat also has Cobalt’s flip down swim step that makes getting onto the swim platform much easier than climbing up a simple ladder. Continuing with the rear facing theme, the backrest of the co-captain’s seat also tilts forward to turn the port side of the R5 Surf into a massive chaise style lounge. And of course there is copious amounts of storage, and hidden below deck is 5 ballast tanks to let you really weigh this boat down and get a pumping wave going. Like I said this boat draws on Cobalt’s larger boats and in the co-captain console there is a day head hidden behind an opening door. The best part? This is standard. This means you can pack this boat with lots of guests and head out all day knowing you don’t have to take a break to answer nature’s call. 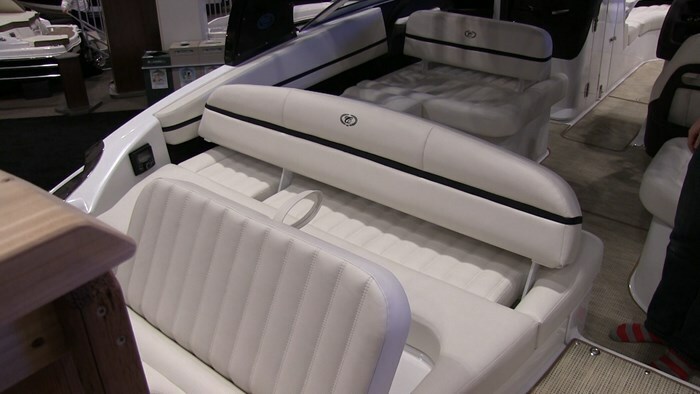 The helm on this boat is definitely a Cobalt as it has refined styling including double stitched leather, tilt steering, flush mounted pop switches, stylish gauges and a premium sound system. 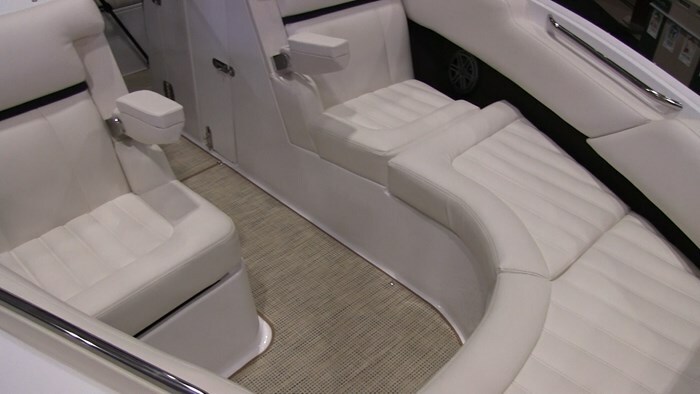 The bow on this boat features a unique layout that gives you a lounger seat on the port side and a captain style seat on the starboard side, both with folding arm rests. Cobalt’s brand speaks for itself and they have been dedicating themselves to water sports for a long time now so this R5 Surf is a natural evolution. Considering their adding exclusive features like their Wave Control System then this is one wave you’re definitely going to want to jump on.